My understanding is that the 996 Turbo did not go on sale in the U.S. until the summer of 2000. 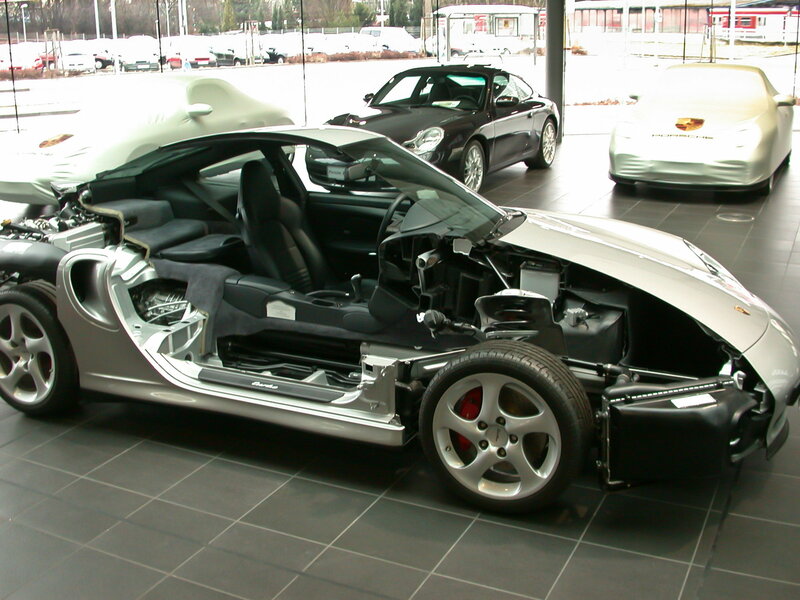 So maybe the 03/00 build was a U.S. demo model used for advertising (journalists/car shows). My guess is the car wasn't sold to a customer in 03/00. ^Did you check for laughs if it had extra rear support? My guess is that it won't have the rear tube brace. I'm beginning to think that the very early pre-official release for customer sale 996 Turbos might have been built on the 996.1 chassis, with the stiffening improvements making into the production line on, or soon after, the 07/00 builds. My information shows that the official 2001 996 Turbo production run (for sale in the U.S.) started in 07/00, with 206 units being built that month, and the last production month for the 2001 996 Turbo being 06/01, with 271 units built that month. I was going to do so but he had a bunch of business papers in the rear seat so I just left it alone since I didn't want to go through his stuff or atleast have him thinking that is what I was doing. Also, going on sale in Summer (6/00) would mean cars would have to be built at-least a few months prior. I think the one I worked on today was one of the earliest examples in the USA but it was just a store purchased car most likely one of the first. Also, came across this Turbo cross section showing the older setup like my own car. don't believe wikipedia allows direct linking. but i'll try and fix it anyways. THAT .. Is a great picture. As Jumper has been correctly pointing out all along even the early Turbos are built on a significantly strengthened Carrera 4 chassis. So I hate to say it but there probably isn't a definitive point of improvement. I'm sure the chassis engineers were constantly adding little bits of strengthening all the way through the production of the 996. There really are no 996.1 or 996.2 chassis. Instead they did constant development from the very beginning of production in 1998 until its end in 2005.
gona have to agree. Unlike fishey's my 12/00 build has the same as your form without the bar running though the form tube area. I have that photo saved. This thread is funny: a bunch of guys run around saying 'no way', 'all BS', 'PCNA screwed up', 'PORSCHE screwed up', etc and when the truth comes out that there was a change between '01 and '02, everyone retreats to arguing about the semantics of previous posts or when the change actually took place - 6/01, 7/01, or 1/02. It does not matter when exactly it happened or who posted what at what instance, there were changes to the turbo's body made between the 2001 and 2002 MYs that made a large difference in chassis stiffness. And I believe this to be true to 100% - because I called the factory to ask. My 2001 tt is in pieces at the body shop at the moment, and I thought I'd take the opportunity to add the stiffening parts if possible. As no one I asked, from tuners/motorsport shops local to me to more prominent shops such as Manthey Motorsport could give me an answer, I called the factory. And I received a call back from a very nice gentleman who explained that, yes there had been changes between '01 and '02, but no, it would not be easy or cost effective to retrofit these bits. So there. And I did not ask exactly when these changes were implemented, but as changes that do not require restructuring the assembly line are often made mid-year, I can easily imagine that some '01 cars have the changes but that the official change was made for the '02 MY. Thanks to Fishey and Vol4life for posting pics. I had looked at the PET and seen the tube at the front of the rear seat pan and the tubes in the roof structure, but I hadn't imagined it would be so easy to see. I never really looked at my car. Will be at the body shop this week anyway, so I will see if my '01 has the tubes or not. BTW, according to the guy from the Porsche AG who I spoke to, the major change was the rear seat pan itself which is made from higher strength steel on the later cars. '02 996 Turbos are in fact not 25% stiffer than all '01 996 Turbos. Anyone who opines that someone should buy an '02 over an '01 because the '02 is 25% stiffer is blowing smoke. Porsche's blanket statement (found in their printed material) that the '02 996 Turbo is 25% stiffer than the '01 996 Turbo is in fact a misstatement. exactly. many of us knew this years before this inanity of a thread began. sheesh. I had already formed an opinion on why it was done but talking to others who know much more then myself are in agreement the changes are almost exclusively done for improved safety rather then improved performance. The tube that runs from the transmission tunnel to the B pillar looks to me like it's primary function is side impact protection. Anyone who opines that someone should buy an '02 over an '01 because the '02 is 25% stiffer is blowing smoke. I never even vaguely alluded to something like this - so I certainly hope you do not mean me. As I definetively discovered on pics today, I own one of the limp 2001 tt's. And am not in the least worried, disheartened, distraught or anything else negative. I dunno. After comparing pics of my car and a post '02 today, I can tell you for certain that the later cars have quite a bit more material in the form of box sections, tubes, etc hidden under the rear quarters than early cars. 25%? That does sound like a lot. But where do you take your certainty from? It is after midnight here and I am too tired to start posting pics from my cell phone and my computer - and I have an early flight to catch. I will post some pics that make very clear that ther are some large differences. And I went back and checked: Dock, I am not quite sure exactly what you were saying in posts #17 and #27, but it certainly reads like "all untrue". I know there were people calling any chassis differences between '01 and '02 BS. These people are definetively wrong. If I've put you in the wrong camp, my apologies. I will post pics as soon as I can. I jump into this thread for some facts based on two cars (2001 and 2002) that I own.. The 2001 does NOT have the solid side impact bar that runs side to side thru the lower seat cushion metal. Interesting that Porsche spent the time making support cages in on each side of the car that ties in each side rocker support and lower floor pan.. These modifications to the pan, and rocker support has to aid in side impact crumple zones. Porsche is trying to tie the rear seat area, rear quarter panel and lower pan area in. In an impact the energy gets transferred into more areas. Is the chassis more stable> yes.. Is it more rigid, it has to be due to the added welds and metal boxing and tubing supports running from one side to the other. My personal opinion is that this is done for safety. The extra rigidity is a by product. How much can be debated.. What's the percentage>>speculation. If I had my family members in the back seat, a 2002 Chassis would offer more structural side impact protection over a 2001..
Last edited by Kevin; 08-17-2015 at 10:59 PM. Did you not see the 2001 pics posted of just the support that you say doesn't exist?